Fincher's White Front Western Wear is located in the heart of the historic Fort Worth Stockyards. The huge, white, two-story building with the rust horse mannequin was originally the home of White Front Western Store, established in 1902. The Fincher Family purchased the store in 1967, and with only two different families owning the store, it has been in continuous operation for almost a century. Fincher's stocks a full line of western wear from infant to adults. 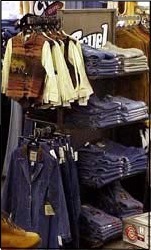 Included are hats, boots, jeans, shirts, blouses, dresses, and suits. We also have cowboy souvenirs, western gifts and rough stock riding equipment. Fincher's may be located in a popular tourist area, but real western families still continue to shop with us. Third and fourth generation customers enter our doors on a daily basis. The true reason for this loyalty is that there is no place else with the kind of personal attention and the knowledge of western products offered at Fincher's. There are many other western stores, but how many of them have been serving customers the same way for a century, where things are done the old-fashioned way. From hand-creased hats to properly fitted boots, Fincher's is the place for your western wear needs!